This excerpt from Mechanistic and Non-mechanistic Science, a book in progress, is the second in a series on bhakti-yoga as an objective science of self-realization. Here we discuss the relationship between the brain, the mind, and the conscious self. The great thinkers can know Him [Krsna] when completely freed from all material hankerings and when sheltered under undisturbed conditions of the senses. Otherwise, by untenable arguments, all is distorted, and the Lord disappears from our sight. To understand some of the practical problems involved in controlling the senses, we must first understand the concept of the material mind. As already pointed out (back to godhead, Vol. 16, No. 10), the jivatma is a complete conscious individual and, as such, is inherently able to carry out the mental functions of thinking, feeling, and willing. Yet the machinery of the body includes a psychic subsystem that duplicates some of these functions. This subsystem acts as an intermediate link between the natural senses of the jivatma and the sensory apparatus of the body. Before reaching the jivatma, data from the bodily senses pass through this subsystem, which enriches and modifies them by additional information representing various thoughts, feelings, and desires. *We stress this point because there are many watered-down systems of yoga or meditation that neglect even the most basic rules for sense control. Seeking self-realization through such systems is like trying to ignite wood while pouring water on it. The positive injunctions of bhakti-yoga prescribe activities that directly engage the jivatma in service to the Supreme Person, Krsna. 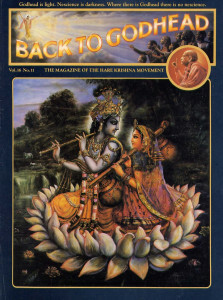 Ultimately these activities awaken the jivatma’s natural love for Krsna. As a corollary to this reawakening, the jivatma automatically loses his attraction for the manifestations of his material mind, which are false theatrical displays inherently less interesting than the absolute reality of Krsna. Thus by engaging in active service to Krsna, one is able to attain the goal of mental control and free one’s senses for further service to Krsna. As soon as irrevocable loving service is established in the heart, the effects of nature’s modes of passion and ignorance (effects such as lust, desire, and hankering) disappear from the heart. Then the devotee is established in goodness, and he becomes completely happy. Thus established in the mode of unalloyed goodness, the man whose mind has been enlivened by contact with devotional service to the Lord gains positive scientific knowledge of the Personality of Godhead in the stage of liberation from all material association.